In 1913, the City of Los Angeles completed an aqueduct from Owens Valley to the City. The aqueduct had a capacity of 480 cubic feet per second (cfs). In 1970, a second aqueduct with a capacity of 300 cfs was completed and began operating, bringing the total capacity of the aqueduct system to about 780 cfs. Los Angeles’ operations to supply the second aqueduct, including the pumping of groundwater in Owens Valley led to litigation by Inyo County against Los Angeles. In a suit filed in 1972, Inyo County claimed that increased groundwater pumping was harming the environment of Owens Valley and that the practice should be analyzed in an Environmental Impact Report (EIR) in accordance with the provisions of the California Environmental Quality Act (CEQA). In 1973, the Court of Appeal for the Third Appellate District ruled that Los Angeles must prepare an EIR (32 Cal. App. 3d 795). Since 1973, Los Angeles has prepared two EIR’s, one in 1976 and another in 1979, but the Appellate Court found both to be legally inadequate. In 1980, the Inyo County Board of Supervisors drafted, and the Inyo County voters passed, a groundwater ordinance to regulate groundwater pumping in the Valley through a groundwater management plan. The plan was to be implemented by a groundwater pumping permit procedure. The ordinance created a County Water Department and a County Water Commission. As a result of litigation commenced against the County by the City of Los Angeles and its Department, the County was directed in May 1981, by order of this Court in case number 12883, not to implement the Ordinance until a legally sufficient environmental impact report had been prepared and adopted by the County. A Final EIR was prepared, but the Final EIR was not adopted by the County. In July 1983, as a result of litigation commenced by the City of Los Angeles and the Department, this Court in case number 12908 ruled said Ordinance unconstitutional, invalid, and preempted by law, and that the implementation of the Ordinance should be enjoined. Pursuant to stipulation of the parties, entry of an injunction and final judgment have not been entered by this Court. resume the CEQA litigation and litigation over the groundwater ordinance’s validity if the parties did not develop and adopt a long term joint groundwater management plan for Owens Valley. In December 1984, the Court of Appeal modified the Writ of Mandate that it had originally issued in 1973, to approve the five-year agreement of the parties. The Court specifically explained that the modification did not imply that a joint long term groundwater management plan would be a new project. The project was would remain as it was — a program increasing the average rate of groundwater pumping and use (both for export and in-valley use), above a baseline rate reasonably representing the average of groundwater pumping and use (both for export and in-valley use) preceding the operation of the second aqueduct. However, the Court did allow that the command of its Writ to prepare an EIR could be met if the EIR were to be presented in conjunction with a joint long term groundwater management plan. In January 1985, this Court approved the interim agreement. In May 1988, as a result of a joint application by Inyo County and the Department, a sixteen (16) month extension by the Court (from February 1989 to June 30, 1990) was granted to the Department for the purpose of completing studies necessary for development of a joint long term groundwater management plan and EIR. In June 1990, Los Angeles and Inyo County requested a further twelve (12) month extension to September 30, 1991. In July 1990, the Court also granted this extension. In August 1991, the Court granted a further extension to October 21, 1991. Since 1984, certain studies budgeted at approximately five million dollars ($5,000,000.00) have been undertaken by Inyo County, Los Angeles, and USGS to learn more about the relationship between groundwater pumping and its impact on native vegetation. As part of these studies, Inyo County and the Department developed extensive information on the geohydrology, water budget, soils, and vegetation of Owens Valley. USGS compiled and analyzed the information and summarized its independent findings in a series of technical reports. These USGS reports, together with other cooperative study materials, became the technical foundation for the joint long term groundwater management plan that has been developed by the parties. Under the joint five-year interim agreement, the two parties cooperatively developed and implemented numerous projects. These enhancement/mitigation projects range in scope from the revegetation and irrigation of certain areas to enhancement of wildlife habitats and recreation areas. The goals and principles of this Stipulation and Order shall apply primarily within Owens Valley, but shall be applied as appropriate to activities of the Department within Inyo County. The Inyo County/Los Angeles Standing Committee and the Inyo/Los Angeles Technical Group formed pursuant to a Memorandum of Understanding between the parties, dated September 2, 1982, will continue in existence to represent the parties in implementing these goals and principles. As agreed by the parties, the Department representatives on the Standing Committee shall include at least one (1) member of the Los Angeles City Council, the Administrative Officer of the City of Los Angeles, two (2) members of the Board of Water and Power Commissioners, and three (3) staff members. The County representatives on the Standing Committee shall be at least one (1) member of the Inyo County Board of Supervisors, two (2) Inyo County Water Commissioners, and three (3) staff members. The Technical Group shall be comprised of not more than five (5) representatives selected by the County and five (5) by the Department. Neither the Technical Group nor the Standing Committee shall make any determination or recommendation as called for in this Stipulation and Order, the Green Book, or the EIR without first obtaining agreement among the Department’s representatives and the County’s representatives. Regardless of the number of representatives from either party in attendance at a Standing Committee or Technical Group meeting, Inyo County shall have only one (1) vote, and Los Angeles shall have only one (1) vote. A. Each well field area has been included in a designated management area. The boundaries of each management area have been established so as to contain all vegetation that could be impacted as a result of groundwater pumping from the well field area during “worst case” conditions(multiple dry years along with heavy pumping). Each management area contains several monitoring sites. Each Department well in a management area is linked to a monitoring site for management purposes. B. The vegetation and groundwater conditions within the management areas will be carefully monitored by the Technical Group to assure that the goals and principles of this groundwater management plan are met. C. If a new well is constructed outside of a designated management area, or if, outside of a designated management area, groundwater pumping is found through monitoring or other means, to cause or to have the potential to cause a significant decrease or change in vegetation or a significant effect on the environment, or if the Department commences water gathering activities outside of the Owens Valley, the Technical Group shall expand the management area as necessary, or shall designate a new management area along with appropriate monitoring requirements. The appropriate vegetation classifications for management shall be established by the Technical Group within the new area and each new management area shall be managed in accordance with these goals and principles. D. It is recognized that vegetation composition and density varies for reasons other than groundwater pumping, from period to period, depending upon weather, precipitation, surface water spreading, and other factors. A. TYPE A CLASSIFICATION. This classification is comprised of vegetation communities with evapotranspiration approximately equal to average annual precipitation. This classification is shown as white on the management maps and includes approximately 150,347 acres. B. TYPE B CLASSIFICATION. This classification is comprised of scrub dominated communities, including rabbitbrush and Nevada saltbush communities with evapotranspiration greater than precipitation. This classification is shown as yellow on the management maps and includes approximately 10,390 acres. C. TYPE C CLASSIFICATION. This classification is comprised of grasslands/meadow vegetation communities with evapotrans- piration greater than precipitation. The communities comprising this classification exist because of high groundwater conditions, natural surface water drainage, and/or surface water management practices in the area, i.e., conveyance facilities, wet year water spreading, etc. This classification is shown as green on the management maps and includes approximately 42,013 acres. D. TYPE D CLASSIFICATION. This classification is comprised of riparian/marshland vegetation communities with evapotranspiration greater than precipitation. The communities comprising this classification exist because of high groundwater conditions, natural surface water drainage, and/or surface water management practices in the area, i.e., conveyance facilities, wet year spreading, etc. This classification is shown as red on the management maps and includes approximately 5,580 acres. E. TYPE E CLASSIFICATION. This classification is comprised of areas where water is provided to City-owned lands for alfalfa production, pasture, recreation uses, wildlife habitats, livestock, and enhancement/mitigation projects. This classification is shown as blue on the management maps and includes approximately 18,830 acres. The overall goal of managing the water resources within Inyo County is to avoid certain described decreases and changes in vegetation and to cause no significant effect on the environment which cannot be acceptably mitigated while providing a reliable supply of water for export to Los Angeles and for use in Inyo County. The goal is to avoid long term groundwater mining from aquifers of Inyo County. This goal will be met by managing annual groundwater pumping so that the total pumping from any well field area over a 20 year period (the then current year plus the 19 previous years) does not exceed the total recharge to the same well field area over the same 20 year period. The Technical Group may increase the annual pumping from a well field area above this amount if a recharge program for that area is implemented or for other relevant reasons that are consistent with these goals and principles. The average annual recharge to each well field area over the 20 year period shall be determined by the Technical Group using information developed by the United States Geological Survey (USGS) and other relevant information, including an analysis of water levels in each well field area. 5. Compensating for the impact by replacing or providing substitute resources or environments. 1. “Feasible” means capable of being accomplished in a successful manner within a reasonable period of time, taking into account economic, environmental, legal, social, and technological factors. Vegetation monitoring sites and water table monitoring wells have been and shall be established inside and outside each management area and Owens Valley town as determined feasible and necessary by the Technical Group. The type of monitoring that will be conducted at each site and at each monitoring well will vary as determined necessary by the Technical Group. Monitoring could include, but is not limited to, measurement of retained soil water, water levels in deep and shallow wells, analysis of vegetation, and the use of photographic monitoring. All monitoring, analysis and interpretation of results shall be done by the Technical Group. The Department shall fund the installation of the necessary monitoring sites and monitoring wells. The Department shall perform such maintenance on the monitoring wells as is necessary. The Department and the County shall jointly maintain the vegetation monitoring sites. In addition to the mitigation measures described below, any significant effect on the environment of Inyo County attributable to groundwater pumping or to Department surface water management practices, shall be mitigated as soon as a reasonable and feasible mitigation plan is developed. Implementation of this plan shall be commenced within twelve (12) months of a determination by the Technical Group or by dispute resolution that a significant effect on the environment has occurred. New wells will be sited and groundwater pumping shall be managed to avoid causing significant adverse effects on water quality or water levels in non-department-owned wells in the Owens Valley that are attributable to groundwater pumping by the Department. Any such significant adverse effects shall be promptly mitigated by the Department. The determination of significant adverse effects shall be made by the Technical Group as provided in section IV.B below. Although this provision is intended to protect owners of wells who are not parties to this Stipulation and Order from impacts attributable to groundwater pumping by the Department, this provision is not a limitation of the legal rights of such non-parties or the parties, nor does it create a binding administrative remedy that must be pursued and exhausted prior to the exercise of any legal right by such a non-party. These goals and principles and the other provisions of this Stipulation and Order will not alter in any way the Department’s existing commitments to supply water to Indian lands in the Owens Valley, or cause a significant adverse effect on such lands. Groundwater pumping and surface water management practices will be managed in a manner that is consistent with state and federal laws pertaining to rare and endangered species. These goals and principles and the other provisions of this Stipulation and Order shall not alter in any way the powers and duties of the Bishop Creek Water Association. The management goals and principles for each vegetation management type are described below. This zone, composed of vegetation with a calculated evapotranspiration rate approximately equal to precipitation, is not affected by groundwater pumping or by changes in surface water management practices since such vegetation survives on available precipitation. The goal is to manage groundwater pumping and surface water management practices so as to avoid causing significant decreases in live vegetation cover, and to avoid causing a significant amount of vegetation comprising either the Type B, C, or D classification to change to vegetation in a classification type which precedes it alphabetically (for example, Type D changing to either Type C, B, or A vegetation). Methods that will be used to achieve this goal include an extensive monitoring program, discretion vested in the Technical Group and/or Standing Committee to take appropriate action, provisions for automatic turning off of wells (see section V), provisions for determining whether significant decreases or changes in vegetation have occurred (see section IV.B), provisions for mitigation, and provisions for dispute resolution. Type B, C, and D classifications are each comprised of several vegetation communities defined in the “Land Classification and Natural Community Descriptions for the Owens Valley” (1987). It is recognized that a change in vegetation from one of these communities to another, as long as the change is not to a community that would fall outside the same classification will not be considered significant. A decrease in live salt cedar cover in the Type D classification generally will not be considered significant. Notwithstanding the fact that wells may have been turned off due to insufficient soil moisture, any decreases or changes in vegetation that are determined to be significant by the Technical Group shall be mitigated as soon as a reasonable and feasible mitigation plan is developed by the Technical Group and implemented by the Department. In developing this mitigation plan, the Technical Group shall consider the potential environmental and water supply effects of any proposed plan. Implementation of this plan shall be commenced by the Department within twelve (12) months of a determination by the Technical Group or by dispute resolution that a significant decrease or change has occurred. A mitigation plan developed by the Technical Group could include restoring perennial vegetation cover in an area where there has been a significant decrease in live perennial vegetation cover, and/or restoring vegetation in an affected area to a vegetation community that falls within the classification shown on the relevant vegetation management map as soon as it can be reasonably restored. Mitigation activities could include, but are not limited to, surface water application or reduction in groundwater pumping (if groundwater pumping has not already been terminated in the affected area in accordance with the provisions of section V). The Department shall continue to operate canals in accordance with its practices from 1970 (past practices have included taking canals out of service for maintenance and for operational purposes). However, any permanent change in canal operations, compared to past practices, shall be subject to prior Standing Committee approval. The Department will continue to determine and implement maintenance activities to control aquatic weeds and ditch bank vegetation in order to maintain canals in a clean and efficient manner. (Lands supplied with water.) These lands will be supplied with water and will be managed to avoid causing significant decreases and changes in vegetation from vegetation conditions which existed on such lands during the 1981-82 runoff year. Significant decreases and changes in vegetation will be determined as set forth in the management goals for the Type B, C, and D vegetation; however, conversion of cultivated land by the Department or its lessee to other irrigated uses shall not be considered a significant decrease or change. Another primary goal is to avoid significant decreases in recreational uses and wildlife habitats that in the past have been dependent on water supplied by the Department. The Department shall continue to provide water for Los Angeles-owned lands in Inyo County in an amount sufficient so that the water related uses of such lands that were made during the 1981-82 runoff year can continue to be made. The Department shall continue to provide water to Los Angeles-owned lands in the Olancha/Cartago area such that the lands that have received water in the past will continue to receive water. Additionally, the Department shall provide water to any enhancement/mitigation projects added since 1981-1982, unless the Inyo County Board of Supervisors and the Department agree to reduce or eliminate such water supply. It is recognized that successive dry years could result in insufficient water to meet all needs. During periods of dry year water shortages, the Technical Group will evaluate existing conditions. A program providing for reasonable reductions in irrigation water supply for Los Angeles-owned lands in the Owens Valley and for enhancement/mitigation projects may be implemented if such a program is approved by the Inyo County Board of Supervisors and the Department, acting through the Standing Committee. In determining (1) whether a decrease in live vegetation cover is “significant,” or (2) whether a change in vegetation from one vegetation classification to another is “significant,” or (3) whether a “significant effect on the environment” has occurred, it is recognized that it is infeasible to develop definitions of these terms for use in all areas and under all conditions. Therefore, a determination of what is a significant decrease or change in vegetation and of what is a significant effect on the environment will be made by a case by case analysis. The first step in this case by case analysis is to determine whether the decrease or change can be measurably demonstrated. If so, it must then be determined by the Technical Group if the decrease or change, or if a potential significant effect on the environment, is or is not attributable to groundwater pumping and/or to surface water management practices. Decreases and changes in vegetation and other environmental effects shall be considered “attributable to groundwater pumping, or to a change in surface water management practices,” if the decrease, change, or effect would not have occurred but for groundwater pumping and/or a change in past surface water management practices. This shall be determined by an analysis of all relevant factors, including a comparison of the affected area with an area of similar vegetation, soils, rainfall, and other relevant conditions where such a decrease, change, or effect has not occurred, or has not occurred to the same degree. – Enhancement and mitigation projects that have been implemented by the Department. By the first of each month the Technical Group shall project the “water balance” for each monitoring site. These monthly projections will be made unless the Technical Group determines that monthly projections are unnecessary because of high soil water conditions. In making these water balance projections, the Technical Group shall compare the estimated amount of soil moisture available to vegetation with the estimated required water needs of the vegetation for the growing season (or appropriate portion thereof) at each monitoring site. These projections shall be made in accordance with procedures contained in the Green Book. The growing season used when water balance projections are made between January 1st and September 1st, shall be the growing season (or appropriate portion thereof) during that calendar year, and no precipitation shall be included in such water balance projections. The growing season used when water balance projections are made between September 1st through December 31st shall be the growing season during the following calendar year. One-half of the average annual precipitation at the monitoring site between October 1st and September 30th shall be included in the October 1st water balance projection. This will be reduced to 40 percent of the annual average precipitation if the average of the actual runoff for the previous runoff year and the forecasted runoff for the then current runoff year is less than 70 percent of average, and to 30 percent of the average annual precipitation if the average of the actual runoff for the two previous runoff years and the forecasted runoff for the then current runoff year is less than 75 percent of average. No precipitation shall be included in the November 1st and December 1st water balance projections. If as of July 1st or October 1st, the projected amount of available soil water at a monitoring site is less than the estimated water needs of the vegetation for the growing season (or appropriate portion thereof), the Department’s wells linked to that monitoring site shall be immediately turned off. In addition to this provision requiring the automatic turn-off of wells, the Technical Group and/or the Standing Committee may at any time turn off such wells as deemed necessary, or take such other action as appropriate, to achieve the goals of this Stipulation and Order. In the event that wells are turned off in any area as a result of the provisions of paragraph B, the Technical Group shall periodically evaluate existing vegetation conditions in that area and determine whether any wells could be turned on. Only those wells whose operation will not contribute to the causation of a significant decrease or change in vegetation could be turned on. Wells that have been turned off could also be turned on if the Technical Group determines that the implementation of mitigation warrants such action. If the Technical Group does not agree to turn on wells in an area, the Department shall leave such wells off until the soil water in the area of the monitoring site has recovered to the estimated water needs of the vegetation as of the time the wells were turned off. Once the soil water in the area of the monitoring site has recovered to the level where the amount available to vegetation is equal to the estimated water needs of the vegetation as of the time that the wells were turned off (as determined by the monthly water balance projections), the Department may turn on the wells that are linked to that monitoring site. The Technical Group, based upon an evaluation of the existing vegetation conditions and other relevant factors, may revise the required level of soil water recovery in a monitoring site area if such a revision is consistent with these goals and principles. These provisions do not prohibit the Department from unilaterally implementing such mitigation consistent with these goals and principles as may be necessary to cause an increase in the soil water in the area of a monitoring site prior to, or after the occurrence of a projected soil water deficit. This means that a well that has been turned off, may be turned on to supply water for mitigation in the area of the monitoring site to which it is linked. The area of the monitoring site within which the soil water must recover to the required level will be determined by the Technical Group. A disagreement over whether wells are to be turned on will be subject to dispute resolution. Certain town supply wells, irrigation supply wells, fish hatchery supply wells, enhancement/mitigation project supply wells, and other wells not affecting areas with groundwater dependent vegetation may be designated by the Technical Group as exempt from automatic turn-off. By April 20th of each year, the Department shall prepare and submit to the Inyo County Technical Group a proposed operations plan and pumping program for the twelve (12) month period beginning on April 1st. (In the event of two consecutive dry years when actual and forecasted Owens Valley runoff for the April to September period is below normal and averages less than 75 percent of normal, the Department shall prepare a proposed plan for the six (6) month period beginning on April 1st and October 1st, and submit such plans by April 20th and October 20th.) The proposed plan and pumping program and any subsequent modifications to it shall be consistent with these goals and principles. 2. The County through its Technical Group representatives shall review the Department’s proposed plan of operations and provide comments to the Department within ten (10) days of receipt of the plan. 3. The Department shall meet with the County’s Technical Group representatives within ten (10) days of the receipt of the County’s comments, and attempt to resolve concerns of the County relating to the proposed pumping program. 4. The Department shall determine appropriate revisions to the plan, provide the revised plan to the County within ten (10) days after the meeting, and implement the plan. 5. The April 1st pumping program may be modified by the Department during the period covered by the plan to meet changing conditions. The Department shall notify the County’s Technical Group representatives in advance of any planned significant modifications. The County shall have the opportunity to comment on any such modifications. 6. Information and records pertaining to the Department’s operations and runoff conditions shall be reported to the County’s Technical Group representatives throughout the year. The Department’s current groundwater pumping capacity may be increased to provide increased operational flexibility and to facilitate rotational pumping. The Department may replace existing wells and construct new wells in areas where hydrogeologic conditions are favorable, and where the operation of that well will not cause a change in vegetation that would be inconsistent with these goals and principles. Prior to the Department’s construction of new wells, the location of each well shall be jointly evaluated by the Technical Group as to the potential impact of its operation on the valley’s vegetation and environment. The evaluation shall include the drilling of one or more test holes, if needed, to develop information on the hydrogeologic conditions at the site, an inventory and classification of vegetation that could be affected by the operation of the well, and the assessment of any other potential significant effects on the environment. Each new well will generally reflect optimum design parameters considering location, economics, and current practice in the industry. The Department will schedule and contract for construction of the well. An aquifer test of up to seventy-two (72) hours duration shall be conducted on each new well. One existing or new monitoring well with appropriate perforations is necessary for the aquifer test. The Technical Group shall determine the location of this monitoring well and the need for any additional monitoring wells and the length of the aquifer test. All data generated from the well construction process shall promptly be made available to the County. The County shall make application for and obtain any well construction permits required by the County or any subdivision thereof. It is recognized that this new well program may result in a change in the areas that would be affected by pumping from existing wells. Therefore, additional monitoring of groundwater tables and vegetation shall be implemented as necessary outside of existing management areas and monitoring requirements shall be altered or created as necessary. The Technical Group shall designate a management area and monitoring site requirements for each new well. The siting and the operation of the well shall be consistent with these goals and principles. Only one well initially shall be constructed and operated in any new area. No additional well(s) shall be installed in the area until the initial well has been operated for at least six (6) months at full intended operational capacity in order to gain information on the area and to minimize the potential for adverse impacts. in accordance with a jointly developed monitoring program. Additional wells may be installed by the Department in the area if operation of the initial well indicates no impacts that would be inconsistent with these goals and principles. Monitoring wells shall be installed as necessary to evaluate any potential effects of the operation of the new well or wells on wells not owned by the Department. Any production wells that are to be permanently removed from service shall be converted into properly sealed monitoring wells or shall be abandoned in accordance with state water well standards. The sealing of a monitoring well shall be designed to prevent cross flow between aquifers. The EIR describes the impacts of the construction and operation of fifteen (15) new wells. The construction and operation of any new wells not described in the EIR will be the subject of a subsequent CEQA review. The Technical Group may agree that some existing wells that now supply enhancement/mitigation projects be converted to Department production wells. Wells that are the only source of supply for an enhancement/mitigation project shall not be converted. Water for the enhancement/mitigation project formerly supplied by a converted well will be supplied as necessary from Department production wells. Any enhancement/mitigation well converted to a production well could later be reverted to an enhancement/mitigation well if agreed to by the Technical Group. A. Any groundwater pumping by the Department on the “Bishop Cone” (Cone) shall be in strict adherence to the provisions of the Stipulation and Order filed on the 26th day of August, 1940, in Inyo County Superior Court in the case of Hillside Water Company, a corporation, et al. vs. The City of Los Angeles, a Municipal Corporation, et al., (“Hillside Decree”). Before the Department may increase groundwater pumping above present levels, or construct any new wells on the Cone, the Technical Group must agree on a method for determining the exact amount of water annually used on Los Angeles-owned lands on the Cone. The agreed upon method shall be based on a jointly conducted audit of such water uses. The Department’s annual groundwater extractions from the Cone shall be limited to an amount not greater than the total amount of water used on Los Angeles-owned lands on the Cone during that year. Annual groundwater extractions by the Department shall be the total of all groundwater pumped by the Department on the Cone, plus the amount of artesian water that flowed out of the casing of uncapped wells on the Cone during the year. Water used on Los Angeles-owned lands on the Cone, shall be the quantity of water supplied to such lands, including conveyance losses, less any return flow to the aqueduct system. B. The overall management goals and principles and the specific goals and principles for each vegetation classification of this Stipulation and Order apply to vegetation on the Cone. It is recognized that development of new groundwater storage, and the implementation and operation of feasible groundwater banking and recharge facilities in the Owens Valley and in the Rose Valley that will not cause significant effects on the environment may be beneficial. The development of any such facilities in the Owens Valley and in Rose Valley are subject to agreement of the Inyo County Board of Supervisors and the Department, acting through the Standing Committee. The Inyo County Board of Supervisors shall not unreasonably refuse to agree to a feasible groundwater banking facility that will not cause significant decrease or change in vegetation or a significant effect on the environment. The EIR describes the implementation of selected groundwater recharge facilities. The operation of such facilities shall be consistent with these goals and principles. The development of any future groundwater recharge and extraction facilities not covered by the EIR will be the subject of a subsequent “CEQA” review. It is recognized that additional cooperative studies related to the effects of groundwater pumping on the environment of the Owens Valley are necessary. The reasonable costs of studies implemented under the Stipulation and Order or the Green Book shall be funded by the Department. If necessary, such funding will be in addition to funds provided under section XIV below. All existing enhancement/mitigation projects will continue unless the Inyo County Board of Supervisors and the Department, acting through the Standing Committee agree to modify or discontinue a project. Periodic evaluations of the projects shall be made by the Technical Group. Subject to the provisions of section VI, enhancement/mitigation projects shall continue to be supplied by enhancement/mitigation wells as necessary. New enhancement projects will be implemented if such projects are approved by the Inyo County Board of Supervisors and the Department, acting through the Standing Committee. Los Angeles shall transfer ownership of the water systems in the towns of Lone Pine, Independence, and Laws to the County or to another Owens Valley public entity or entities. The transfer of ownership will be for a price of one dollar ($1.00) per water system. The method of transfer will be a lease purchase agreement wherein the transfer of the ownership of each system will be complete at the end of five (5) years from the date of entry of this Stipulation and Order. Prior to the transfer of the water systems, the County and the Department will jointly select and will have an independent engineering firm inspect each of the systems for compliance with all applicable requirements (including water quality) of the California Department of Health Services and other agencies, and perform a structural assessment of the Independence Reservoir including its ability to withstand seismic events. The costs of this inspection shall be funded by the Department. Prior to the transfer of the systems, the Department will make any repairs or alterations necessary to bring each distribution system into compliance with all such applicable requirements. The County (or other public entity operating the water system) shall pay the Department for water used in excess of these totals in an amount that would reflect the actual incremental cost to the Department of operating and maintaining the wells and reservoirs to provide the excess amount. During the five (5) year lease period, the County or the public entity or entities shall set the water rates for the three town water systems, operate and maintain all components of the water systems (except the wells, pumps, chlorination equipment, and reservoirs), begin the transition for operating and maintaining the chlorination equipment, handle all billing and related matters, and establish a capital reserve fund for replacement of components of the systems in the event of emergency or deterioration. At the end of the five (5) year lease period, the County or other public entity or entities shall assume total ownership and operation of each town water system, except that the Department shall continue to own and operate the wells. The Department shall supply untreated water to each water system at no cost up to the annual amounts described above. The County (or other public entity) operating each water system shall pay the Department for water used in excess of these totals in an amount that reflects the actual incremental costs of supplying water in excess of these totals. It is recognized that Los Angeles has leased the town water system in Big Pine to the Big Pine Community Services District. It also is recognized that the lease requires certain considerations favorable to the District in the event of a permanent transfer of the town water systems in the other Owens Valley towns as part of an overall settlement of litigation. In view of this, the same benefits and opportunities will be provided to the Big Pine water system as are available to the three other Owens Valley water systems. This includes providing untreated water to the system without charge up to five hundred (500) acre feet per year. The parties, together with the California Department of Fish and Game will complete a management plan that is now in preparation for the Lower Owens River by June 1, 1992. The County and the Department shall actively seek to secure funding for the construction and operation of the Lower Owens River project from the State of California and from other funding sources. Construction of the project shall be commenced by the Department within three (3) years after Court approval of this Stipulation and Order unless otherwise agreed by the Inyo County Board of Supervisors and the Department. Prior to implementation, the project will be the subject of a CEQA review separate from the EIR which describes this Stipulation and Order. The project plan will include the construction of a pumpback station from the river near Keeler Bridge to the Los Angeles aqueduct. The pumpback system will be capable of pumping up to fifty cubic feet per second (50 cfs) from the river to the aqueduct. Due to seasonal fluctuation in the flow of the river, the average annual pumping in any year will not exceed approximately thirty-five cubic feet per second (35 cfs). The plan will also provide that water releases would be made to the river above Blackrock Gate on the Los Angeles aqueduct (but below the aqueduct intake), that the existence of off-river lakes and ponds now supplied by the existing project will be continued, and for a water release from the pumpback station to supply the southern end of the river and the Delta. It is recognized that the release to the southern end of the river and the Delta may be constrained by the legal requirements concerning the Department’s release of water to Owens Lake. – The water flow and schedules needed to maintain a healthy and productive warm water fishery in the lower Owens River and in the off-river lakes and ponds. – The specific water diversion and release points to supply the project. – The locations of ponds and pools in and adjacent to the Lower Owens River, and the proposed methods to manage these to produce and maintain a viable fishery. – The requirements for channel maintenance. – The plans for fish stocking. – The plans for tule and other plant control in the river and the off stream ponds and lakes. The Department shall construct, operate, and maintain the pumpback system. The total cost of the construction of the pumpback system, new release structures, channel modifications, and other necessary work for initial operation of the project is estimated by the Department to be approximately seven and one-half million dollars ($7,500,000.00). The Department shall fund the initial construction costs of the project and the State of California, the County or other sources shall contribute fifty percent of actual costs up to three million seven hundred fifty thousand dollars ($3,750,000.00) to the Department. The Department shall pay for the annual cost of operating the pumpback system less any funds received from other non-County sources. Once the project has been constructed and completed, the Department and the County would jointly operate and fund the non-pumpback portions of the project. In the event that Inyo County is required to fund any portion (up to $3.75 million) of the costs of constructing the Owens River pumpback system, Los Angeles shall loan Inyo County the amount of the County’s share of such costs. The County shall repay such loan without interest and shall make annual payments in the amount of three hundred thousand dollars ($300,000.00) until the loan is fully repaid. The Department shall conduct and finance seismic studies required by the California State Department of Water Resources to determine if South Haiwee Dam can be safely operated at reduced storage levels. If such operations are allowed, the Department and the County shall develop a recreation plan for South Haiwee reservoir, and the Department shall open this facility to public recreation pursuant to the plan. The recreation plan will be implemented and operated by the County or by a concessionaire. In the event that the continued operation of South Haiwee is not allowed, the parties shall jointly develop a recreation plan for North Haiwee Reservoir and such plan will be implemented if it is feasible to do so. Any plan must take into consideration Los Angeles’ operating and security needs. The plan must also take into consideration the fluctuations of water levels and the requirements for water treatment. The Department shall provide funding to the County for an initial three (3) year salt cedar control effort and for an annual maintenance and control effort in the Owens Valley area. This effort shall be conducted by Inyo County. The salt cedar control effort will be commenced as soon as feasible following entry of this Stipulation and Order. The annual control program will be based on the same control priorities as described above. The funding of the initial three (3) year program shall be three hundred fifty thousand dollars ($350,000.00) for the first year and two hundred thousand dollars ($200,000.00) for the second and third years. A three hundred fifty thousand dollar ($350,000.00) payment shall be made by the Department to the County within sixty (60) days of entry of this Stipulation and Order. Thereafter, the second and the third year payments shall be made by twelve (12) months and twenty-four (24) months after the first payment, respectively. The first annual maintenance and control effort payment shall be made to the County by July 10th following the making of the last payment of the initial three (3) year program. This payment shall be in the amount of fifty thousand dollars ($50,000.00). Thereafter, each annual payment shall be made by July 10th, and the amount of each payment shall be the previous year’s payment adjusted upward or downward each year in accordance with the Los Angeles – Anaheim – Riverside All Urban Consumers Price Index or its successor. The maximum adjustment shall not exceed five (5) percent in any year. The annual payment shall be placed in trust by the County and will be used only for the purposes of salt cedar control. If, at anytime, one hundred fifty thousand dollars ($150,000.00) or more is accumulated in the trust, the Department shall not be required to make an additional payment until such time as the funds in the trust are less than fifty thousand dollars ($50,000.00) on June 30th of any year. The annual funding for salt cedar would continue unless the Inyo County Board of Supervisors and the Department, through the Standing Committee, agree that the salt cedar control program is to be reduced in scale or terminated. It is recognized that even with an initial and an annual control effort, salt cedar may not be fully controlled in the Owens Valley. The Department shall provide funding as provided herein to the County for rehabilitation of existing County parks and campgrounds, development of new County campgrounds, parks, and recreational facilities and programs, and for the annual operation and maintenance of existing and new facilities and programs. These facilities are now, and will be, located on lands owned by the City of Los Angeles. During the ten (10) years following entry of this Stipulation and Order, the County will rehabilitate certain existing parks and campgrounds and develop certain new parks, campgrounds, recreational facilities and programs. These facilities will be developed in accordance with a master plan now being prepared by the County, or in accordance with any future plans developed by the County. Among the first facilities considered for rehabilitation will be the Pleasant Valley Campground, the Baker Creek Campground, Dehy Park, and Diaz Lake. Among the first new facilities and programs considered for development will be certain campgrounds along the Owens River from Pleasant Valley Reservoir to the Owens River Delta, and a recreational use and management plan for that reach of the Owens River. The construction of new facilities and any significant changes in existing facilities will be subject to a CEQA review. During this ten (10) year period, the Department shall provide up to two million dollars ($2,000,000.00) to the County for the above purposes. The amount of funds provided in any year shall be based upon the work to be undertaken on such activities by the County during that year. The funds provided may only be used by the County for the purposes described in the above text. To financially assist the County in the operation and maintenance of existing and new parks, recreational facilities and programs operated by the County on lands owned by the City of Los Angeles, the Department shall make an annual payment to the County. The initial payment shall be made within sixty (60) days of entry of this Stipulation and Order. If the entry of this Stipulation and Order occurs during the month of July, the payment would be one hundred thousand dollars ($100,000.00). If entry of this Stipulation and Order occurs between August 1st and June 30th, the payment shall be the sum of one hundred thousand dollars ($100,000.00) prorated. The proration shall be based upon the month of the July-June fiscal year when entry of this Stipulation and Order occurs. For example, if entry of this Stipulation and Order occurs in either January or June, the payment would be five twelfths of one hundred thousand dollars (5/12 of $100,000.00), or one twelfth of one hundred thousand dollars (1/12 of $100,000.00), respectively. After the initial payment, an annual payment shall be made by July 10th of each year, and the amount of the payment for the first full fiscal year following final approval shall be one hundred thousand dollars ($100,000.00). Each year thereafter, the amount of the annual payment shall be the previous year’s payment adjusted upward or downward each year in accordance with the Los Angeles – Anaheim – Riverside All Urban Consumers Price Index or its successor. The maximum adjustment shall not exceed five (5) percent in any year. The annual funding shall be placed in trust by the County and shall be used only for the purposes of operation and maintenance of existing and new parks, recreational facilities and programs. If at anytime three hundred thousand dollars ($300,000.00) or more were to be accumulated in the trust, the Department shall not be required to make an additional annual payment until such time as the funds in the trust are less than one hundred thousand dollars ($100,000.00) as of June 30th of any year. This annual funding shall continue unless the Inyo County Board of Supervisors and the Department agree that the operation and maintenance program is to be reduced in scale or terminated. The Department shall assist the County in funding water and environmentally related activities by making an annual payment to the County. The first payment shall be made within sixty (60) days of approval of this Stipulation and Order by both the County and Los Angeles. The amount of the first payment shall be the sum of eight hundred twenty thousand five hundred eighty dollars ($820,580.00) minus the amount of any previous payments made by the Department to the County for these activities during the 1991-92 fiscal year. After the initial payment, an annual payment shall be made by July 10th of each subsequent year. The amount of the first such payment shall be eight hundred twenty thousand five hundred eighty dollars ($820,580.00) adjusted upward or downward in accordance with the Los Angeles – Anaheim – Riverside All Urban Consumers Price Index or its successor. Each year thereafter, the amount of the annual payment shall be the amount of the previous year’s payment adjusted in accordance with said consumer’s price index. The maximum adjustment shall not exceed five (5) percent in any year. Annual funding shall be placed in trust by the County and shall be used only for purposes of operation and maintenance of water and environmentally related activities. If at anytime one million five hundred thousand dollars ($1,500,000.00) or more is accumulated in the trust, the Department shall not be required to make an additional annual payment until the funds in the trust are less than eight hundred twenty thousand five hundred eighty dollars ($820,580.00) as of June 30th of any year. This annual funding will be discontinued as of the date of a final decision by a court to disapprove this Stipulation and Order. This annual funding shall continue unless the Inyo County Board of Supervisors and the Department agree that the program is to be reduced in scale or terminated. To assist the County in providing services to its citizens, the Department shall make an annual contribution to the County. The first contribution shall be made within sixty (60) days of approval of this Stipulation and Order by both the County and Los Angeles. The amount of the first payment shall be the sum of one million two hundred twenty-one thousand six hundred eighty-five dollars ($1,221,685.00) minus the amount of any previous contributions made by the Department to the County for these services during the 1991-92 fiscal year. After the initial contribution, an annual contribution payment shall be made by July 10th of each subsequent year. The amount of the first annual contribution payment shall be one million two hundred twenty-one thousand six hundred eighty-five dollars ($1,221,685.00) adjusted in accordance with the formula for assessment of Los Angeles-owned property as set forth in present Article XIII, Section 11 of the California Constitution. Each year thereafter, the amount of the annual contribution payment shall be the amount of the previous year’s payment adjusted in accordance with said formula. In the event that Los Angeles’ existing geothermal leases in the Coso Geothermal area of Inyo County are developed in such a manner that the County receives possessory interest taxes on such leases, such taxes received by the County shall be credited to the Department for up to one-half of the total annual general financial contribution to the County. Such credit shall only be made if the possessory interest taxes received are not subject to a claim for refund, legal challenges, or to refund for other reasons. These annual contribution payments will be discontinued as of the date of a final decision by a court to disapprove this Stipulation and Order. The Department shall provide up to one hundred thousand dollars ($100,000.00) for reconstruction and upgrading of the ditch system and for construction of additional ditches to supply additional properties in the town of Big Pine. The ditch system must be planned, constructed, operated, and maintained by a Big Pine entity or organization separate from the Department or the County, except for existing ditches on Los Angeles-owned land which will continue to be maintained by the Department. This entity or organization must obtain all necessary rights of way prior to construction. The Department shall make a flow of up to six (6) cfs available to supply the ditch system with water. This is in addition to water now diverted for use by Big Pine Water Association members. Water to replace any water used by this project will come from a new well, which will be constructed by the Department west of Big Pine. This well may also supply water to the Big Pine Water System. The stockholders of the Big Pine Water Association must approve the use of existing ditches. The Department (a stockholder) shall not unreasonably refuse such approval, or unreasonably refuse the right to use or modify existing ditches on Los Angeles-owned property. Water rights of all stockholders must be protected and current water delivery rates maintained. Provisions will be made to insure that the project funds will only be made available to an appropriate entity or organization and only will be made available as construction of the Big Pine ditch system or other approved projects progresses. Any costs of constructing the ditch system in excess of one hundred thousand dollars ($100,000.00), must be secured prior to commencement of funding of the construction of the ditch system. Project funds would only be made available if substantial construction of the ditch system is commenced within two (2) years of the entry of this Stipulation and Order. If such construction is not commenced within this two year period, unless otherwise agreed by the Inyo County Board of Supervisors and the Department, through the Standing Committee, the funds shall be used for a project other than a ditch system. If less than $100,000 is expended on the ditch system, or if no ditch system is constructed, the unexpended difference may be used by the Big Pine entity or organization on other projects in Big Pine that have been approved in advance by the Department and the Inyo County Board of Supervisors, acting through the Standing Committee. To financially assist the City of Bishop in the operation and maintenance of its park and other environmentally related activities, the Department shall make an annual payment to the City of Bishop. The first annual payment shall be made within sixty (60) days of entry of this Stipulation and Order. If entry of this Stipulation and Order occurs in the month of July, the payment will be one hundred twenty-five thousand dollars ($125,000.00). If entry of this Stipulation and Order occurs between August 1st and June 30th, the payment shall be the sum of one hundred twenty-five thousand dollars ($125,000.00) prorated as set forth in paragraph B above. Thereafter, the annual payment shall be made by July 10th of each year, and the amount of each payment shall be the previous year’s payment adjusted upward or downward each year in accordance with the Los Angeles – Anaheim – Riverside All Urban Consumers Price Index or its successor. The maximum adjustment will not exceed five (5) percent in any year. Except as provided below, Inyo County shall make an annual payment to the City of Bishop in an amount equal to the payment made by the Department during that year; provided however, in any given year this obligation of the County shall be completely satisfied by its payment to the City of Bishop pursuant to Inyo County Code Section 3.40.010 et seq. (transaction and use tax) regardless of the amount of such payment. Inyo County, in order to provide for the future orderly development of towns within the County, has requested Los Angeles to offer for sale seventy-five (75) acres of Los Angeles-owned land within the general areas designated by the boundaries noted on the maps attached as Exhibit B. In order to cooperate with the County’s request, Los Angeles agrees to offer for sale, either at public auction or to the County for public purposes, said seventy-five (75) acres, consistent with the requirements of the Los Angeles City Charter for the sale of real property. To ensure that any sales of the seventy-five (75) acres furthers the County efforts for the orderly development of the towns within Inyo County, the parties further agree to jointly confer on the location of, and the schedule for, the sale of each parcel pursuant to this paragraph. As part of such orderly development, the parties further agree that prior to the sale of any such parcels, there must be available a public water system to serve such property after its sale. Because the location of the proposed sale of the seventy-five (75) acres is sufficiently determined in this Stipulation and Order, by its approval of this document, Los Angeles City Council grants approval, as required by the Los Angeles City Charter, for the Board of Water and Power Commissioners to subsequently engage in the actual sale of individual parcels. The terms of each sale will be subject to approval by the Los Angeles City Council. The area of any property that is undeveloped as of the date of entry of this Stipulation and Order, located within the designated release areas, and sold by Los Angeles after entry of this Stipulation and Order will be credited against the seventy-five (75) acre total. Each such sale is subject to a CEQA review. In addition to the sales described above, Los Angeles will sell at public auction, or sell directly to the City of Bishop or the Bishop Community Redevelopment Agency, properties within the Bishop City limits totaling twenty-six (26) acres of surplus Los Angeles-owned land. Such sales are subject to the Los Angeles City Charter. The location of each property and the schedule for sale must be agreed upon by the City of Bishop and Los Angeles. Each parcel sold must be located within general areas designated by boundaries on the attached map. Authorization to sell up to twenty-six (26) acres of surplus properties within designated release areas is granted by the Los Angeles City Council by its approval of this Stipulation and Order. By this approval, the Department’s Board of Water and Power Commissioners is authorized to act on behalf of the City in approving and conducting such sales. However, the terms of each sale will be subject to approval by the Los Angeles City Council. Each sale is subject to a CEQA review. Nothing in these concepts precludes the City of Los Angeles and the City of Bishop from reaching an agreement for the sale of all or part of the twenty-six (26) acres prior to entry of this Stipulation and Order. Any land so sold will be credited against the twenty-six (26) acre total. In addition to the above described sales, upon request of the Inyo County Board of Supervisors or the Bishop City Council, Los Angeles shall negotiate in good faith for the sale at public auction of additional surplus Los Angeles-owned land in or near valley towns for specific identified needs. Any such sales shall occur subsequent to those described above. A precondition of a sale would be that a public water system must be available to serve each property after its sale. Each such sale would be subject to a CEQA review. It is recognized that such sales at public auction may take considerable time, and that such sales require approval of the Department’s Board and the Los Angeles City Council, and must be in compliance with the Los Angeles City Charter. Decisions on this matter by the Department’s Board of Commissioners and the Los Angeles City Council shall not be subject to dispute resolution. Los Angeles shall negotiate in good faith for the sale or lease to the County of any Los Angeles-owned land requested by the County for use as a public park or for other public purposes. Any sale of land shall be at fair market value and any land sold must be within or adjacent to valley towns. Because of the above provisions for land releases, Inyo County will support passage of withdrawn land legislation pertaining to federally owned lands in Inyo County. 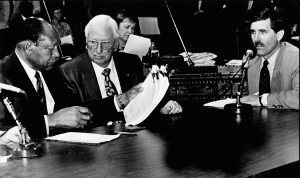 Such legislation is to be in substantially the same form as the draft of such legislation discussed by the parties in the fall of 1987, except that the proposed legislation will be modified to allow lands in Rose Valley which might be used in conjunction with a groundwater storage program to remain in withdrawn status. The County will support such legislation even though the status of such withdrawn lands is under review by the Federal Bureau of Land Management as part of the new Bishop Resources Area Management Plan. Except as provided below, the County and Los Angeles shall refrain from seeking or supporting any legislation, administrative regulation, or litigation that would weaken or strengthen local or state authority to regulate groundwater or that would affect any provision of this Stipulation and Order. A. Neither the County nor Los Angeles may sponsor, take a support position, or seek to amend any legislation or administrative regulation or initiate any litigation that would directly affect any provision of this Stipulation and Order or that would weaken or strengthen local authority to regulate groundwater unless such sponsorship, support, amended position or litigation is first approved by the other party. B. Neither the County nor Los Angeles may take a position in opposition to any legislation or administrative regulation that could directly affect any provision of this Stipulation and Order or that would weaken or strengthen local authority to regulate groundwater without first notifying the other party and attempting to reach concurrence on the proposed course of action. Failure to reach agreement on the proposed course of action will not preclude either party from opposing such legislation. The County and the Department shall make any data or information in its possession that reasonably pertains to purposes of this Stipulation and Order available to the other party on reasonable notice. The County and the Department recognize that such a free exchange of data and information is essential to the purposes of this Stipulation and Order. The County and the Department shall provide to the other party reasonable access to its wells, water conveyance, metering devices, control structures, etc. for the purpose of such independent monitoring and inspection as is necessary to carry out the implementation of this Stipulation and Order. Any project implemented pursuant to California Health and Safety Code section 42316 is not a part of this Stipulation and Order. Los Angeles or its Department shall have the right to seek and use funding from a lessee if a new enhancement/mitigation project is developed on lands leased by the lessee from Los Angeles and the project will increase the value of the lease. Such funding may be obtained through normal Department ranch leasing practices. Except as provided above, lease charges and/or charges for water supplied by Los Angeles and its Department to its Owens Valley lessees may not be increased or decreased, or altered in any way, as a result of any provision of this Stipulation and Order. This provision is not to be construed as preventing rent increases which the City may determine to implement in the ordinary course of business following its usually applicable practices and principles in the determination of the need for rent increases, capitalization of improvements, or land reclassification. The County and the Department and the City of Los Angeles shall keep and hold each other free and harmless from any and all cost, liability, damage, or expense including cost of suit or expense for legal service claimed by anyone by reason of injury or damage to person or properties sustained in or on or about any enhancement/mitigation project, mitigation measure, or monitoring site as proximate result of acts or omissions of a party, its agents, servants or employees, or arising out of any condition of the property occupied by an enhancement/mitigation project, mitigation measure or monitoring site or arising out of the operation of the parties upon, about or above the property occupied by an enhancement/mitigation project, mitigation measure or monitoring site. Except as may be provided above, this provision does not, and shall not be construed to require the County of Inyo, its employees, agents, or consultants to keep and hold harmless the City of Los Angeles, its Department, or any of their employees, agents, or consultants, from any cost, liability or damage, or other relief claimed or sought by anyone, or any organization or entity, that arises out of the Department’s water gathering activities in Owens Valley, including its groundwater pumping and its surface water management, or that arises out of the management of its lands by the City of Los Angeles. This stipulation and Order is not a limitation of the legal rights of any person, organization, or entity that is not a party to this Stipulation and Order, nor does it create a binding administrative remedy that must be pursued and exhausted prior to the exercise of any legal right by such non-parties to this Stipulation and Order. Any water right of either the County or of Los Angeles or of any other person existing prior to the entry of this Stipulation and Order will not be adversely affected, directly of indirectly, by this Stipulation and Order. No water right of any kind, including but not limited to prescriptive water rights, nor any claim thereto, shall arise or be created in favor of or against any party or other person, directly or indirectly, as a result of this Stipulation and Order. Los Angeles and its Department shall not construct a third aqueduct to carry water from Inyo County or enlarge the capacity of the two existing aqueducts above the maximum flow in each aqueduct that occurred before July 1, 1989. The maximum flow for each aqueduct is set forth in the Department’s Daily Flow Records. Los Angeles and the County acknowledge that there are certain risks in maintaining current and projected water supplies to Los Angeles. These foreseeable risks are a possible reduction in diversions by Los Angeles from the Mono Basin, contamination of the San Fernando Valley Groundwater Basin, uncertainty in the amount of water exports from the Sacramento/San Joaquin Delta, a reduction in now available Colorado River supplies to Southern California and reasonably foreseeable population growth in Los Angeles and California. Such foreseeable risks shall not be a basis for a future request to a court to terminate this Stipulation and Order absent agreement by the Inyo County Board of Supervisors, the Department, and the City of Los Angeles. If, as a result of information gained from ongoing research or cooperative studies, or for other reasons as may be necessary to better achieve the goals of this Stipulation and Order, or for purposes of improving the monitoring and evaluation activities, the Department and the Inyo County Board of Supervisors, by agreement, may modify: 1) any provision of the Green Book, including its provisions for monitoring sites, the type of monitoring, and the interpretation of monitoring results; 2) the Management Areas (section I); 3) the Management Maps (section II); and 4) the soil moisture “triggering mechanism” for turning off wells (sections V.A, B, and C), including a substitution of an entirely new “triggering mechanism.” A disagreement over such a modification shall be subject to dispute resolution. The remaining provisions of this Stipulation and Order, other than those identified above, may be modified by agreement between the Department and the Inyo County Board of Supervisors, and approval of such modification by the Court. Approval by the Court shall be upon written noticed motion. Notice shall be given in accordance with California Civil Procedure Section 1005, and published in Los Angeles and Inyo counties in accordance with Government Code Section 6062a. 1. Whether a decrease or change in vegetation or a potential significant effect on the environment is attributable to groundwater pumping or a change in surface water management practices. 2. Whether a significant decrease or change in vegetation or a significant effect on the environment has occurred. 3. A reclassification of vegetation inside or outside a management area. 4. The location of monitoring sites or monitoring wells, the type of monitoring to be conducted at a site, or the interpretation of monitoring results. 6. The need for mitigation or type of mitigation. 7. The linkage of wells to monitoring sites and the area of the monitoring site where soil water must recover. 8. A disagreement over whether or not the “triggering mechanism” based on soil moisture should be modified or changed to a different triggering concept. 9. Whether a well turned off under the provisions of section V should be turned on. 10. Consistency of a proposed pumping program with the goals and principals of this Stipulation and Order. 11. Disagreements over additional cooperative studies. 12. Whether water quality or water levels in a well not owned by the Department has been significantly adversely affected by groundwater pumping by the Department. 13. Any other matter covered by or arising out of the Stipulation and Order or the Green Book. Within fourteen (14) calendar days of the receipt of a written request from either party, the Technical Group shall convene for the purpose of attempting to resolve a disagreement over a matter which is to be decided by the Technical Group, or upon which the Technical Group is required to make a recommendation to the Standing Committee. If the Technical Group agrees on a resolution, that agreement shall be submitted to the Standing Committee for consideration and implementation if concurred with by the Standing Committee. In the event that the Technical Group is unable to resolve a matter, or is unable to make a unanimous recommendation to the Standing Committee, the Technical Group shall make a written report to the Standing committee explaining the areas of agreement, if any, the subject or subjects of disagreement, and each party’s argument in favor of its position along with supporting data and background. This report shall be made within seven (7) calendar days after the Technical Group meeting, unless the Technical Group by unanimous vote, agrees to a longer time period. Within fourteen (14) calendar days of the receipt of such a written report of disagreement from the Technical Group, the Standing Committee shall convene concerning the subject of the report. Additionally, within fourteen (14) days of receipt of a written request from either party, the Standing Committee shall convene for the purpose of hearing any matter which is to be determined by the Standing Committee, or a disagreement between the parties. If the Standing Committee is unable to resolve a dispute or claim within twenty-one (21) days of the receipt of a Technical Group report or a written request to meet, either party may submit the disputes or claims for mediation/temporary arbitration. Such a submittal shall be made by so notifying the Standing Committee in writing. Mediation/temporary arbitration shall be conducted by three (3) mediators unless a single mediator is agreed upon by the Standing Committee. One (1) mediator shall be selected by Inyo County and one (1) mediator shall be selected by the Department. The two (2) mediators selected by the parties shall select a third mediator. In the event of mediation, each party will pay their own costs and one-half of the costs of the mediation. If, by the forty-fifth (45th) day after a party has invoked mediation, there is no mediated resolution, the mediators shall present written findings to the Standing Committee. These findings shall be submitted to the Standing Committee not later than the sixtieth (60th) day after mediation was invoked by a party. Unless otherwise agreed by the Standing Committee, the County and the Department shall immediately implement and follow the findings of the mediators. Any recommendation or finding of the mediators must be based upon the “goals” and “principles” and other provisions of this Stipulation and Order, the Green Book, or the EIR. If a dispute or claim has not been resolved through mediation/temporary arbitration, a party may submit that dispute or claim for resolution to the Superior Court Judge then assigned to Inyo County Superior Court Case No. 12908, by filing with the Judge, and serving upon the other party, a memorandum which sets forth the disagreement, the party’s contentions, its argument in favor of its position, and any supporting evidence and points and authorities. The memorandum shall be filed and served within fifteen (15) calendar days after the issuance of written findings by the mediators unless both parties agree in writing to a longer time period. The other party may file a responsive memorandum that sets forth its view of the disagreement, its contentions, its arguments in favor of its position, and any supporting evidence and points and authorities. Such a memorandum shall be filed and served upon the other party within fifteen (15) days of the service of the initiating papers. Not later than fifteen (15) calendar days after service of any responsive memorandum, or of the date for serving such a memorandum if none is filed, the parties shall file with the Judge a joint memorandum setting forth all the relevant factual and legal issues upon which they agree, and all the factual and legal issues to be resolved, together with any additional supporting or rebutting evidence and any additional points and authorities. The Judge will set the matter for hearing, ordinarily within fifteen (15) calendar days after the date of filing the joint memorandum. The Judge shall endeavor to issue a decision on the unresolved factual and legal issues as soon as possible, ordinarily within twenty (20) days after the hearing. Failure of a party to file the initiating memorandum with the Court within fifteen (15) calendar days, precludes a submission of the particular dispute or claim to the Judge. In the event that the present Superior Court Judge presiding over Inyo County Superior Court Case No. 12908 ceases to act, the Chair of the Judicial Counsel shall be requested to assign a successor judge from a neutral County. The parties shall have the right of challenge pursuant to the California Code of Civil Procedure. The parties will at the time of the request attempt to nominate to the Chair of the Judicial Council a neutral judge or judges to serve as the successor judge. The decision of the Judge shall be binding on the parties. No appeal of the Judge’s decision may be made, except as provided in California Code of Civil Procedure, section 1284, and sections 1285 through 1294.2, provided that the time limit to serve and file a petition to confirm pursuant to section 1288 shall be reduced to one hundred eighty (180) days. Nothing in this Stipulation and Order shall affect Inyo County Superior Court Case No. 12883 (the EIR case brought by Los Angeles concerning Inyo County’s Groundwater Ordinance). A final order in Inyo County Superior Court Case No. 12908 on this Court’s ruling on Inyo County’s Groundwater Ordinance shall not be entered or filed. Additionally, during the term of this Stipulation and Order, the County, its agents, servants, officers and employees, and all other persons acting in concert with the County, are enjoined from applying, implementing, or enforcing in any manner whatsoever, the County of Inyo Owens Valley Groundwater Management Ordinance, enrolled as Chapter 7.01 of the Inyo County Code, and Inyo County Ordinance No. 395; provided however, that the Inyo County Water Department and Inyo County Water Commission may remain in existence to carry out the provisions of this Stipulation and Order. Further, during the term of this Stipulation and Order, the County will not seek any appellate review of the ruling, decision, or injunction of this Court in Inyo County Superior Court Case Number 12908. Judgment implementing this Stipulation may be entered in accordance herewith without further notice to the parties. The paragraph titles herein are for convenience only and do not define, limit, or construe the contents of such paragraphs. The City and its Department may change said address by notice in writing to the County. The County may change said address by notice in writing to the City and its Department. Notice shall be considered given either (a) when delivered to the recipient, or (b) on the date shown on the return receipt when deposited. Michael Gage, President, Los AngelesBoard of Water & Power Cmsn. Vice President, Los Angeles Board of Water & Power Cmsn.